The stunning companion to Kate Atkinson's number-one best seller Life After Life, "one of the best novels I've read this century" (Gillian Flynn). 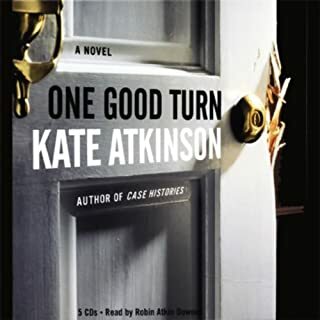 Full disclosure: I am not a diehard Kate Atkinson fan. I've read some of her past works and they just doesn't engage me like they do other readers. That said, I did like the setting and main character of this latest story. Teddy is a wonderful man, a hero in my mind, and someone I would love to sit and a chat with. He is almost the same age as my father, who also flew bombing raids (to Japan, not Europe) and I saw similarities in their behavior when they returned home from the war. If only the entire novel were about Teddy but instead, we are treated to a storyline involving Viola, the obnoxious and awful daughter of Teddy and his wife Nancy. She is thoroughly unlikable and I hated spending so much time in her company when I could have been spending it with Teddy instead. The story winds through many decades and ends in a satisfactory manner for most of the characters. But, it was a long road. 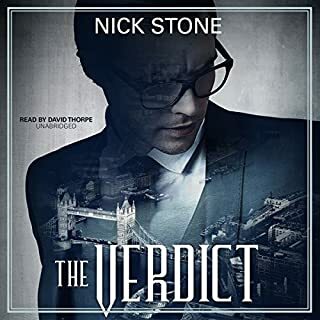 The narrator, Alex Jennings, did a wonderful job of capturing the energy and voices of so many of the characters. A completely compelling follow up/companion piece to Atkinson's Life After Life. I don't want to risk spoiling the story so I won't ramble on here. My only suggestion is to read both books in order and don't leave too long between the listens. I disagree with the publisher in that A God in Ruins, to me, is not a free standing novel--it absolutely needs Life After Life. Atkinson does not disappoint. A beautiful book. I loved it. What a fabulous novel to stumble upon. In all my recent historical inquiries, trying to piece together in my head the Century that birthed me, the tender inquisition of this novel is such loving surprise. This is one of those books about time and family and age and war and reprieve and forgiveness and ascension and growing old in all inglorious and beautiful ways that people do, or don't when they're shot out of the air like a lark lost to and of its song. This book is suffused of that certain light whose voice seems to be speaking just precisely to you. What made the experience of listening to A God in Ruins the most enjoyable? Atkinson's style and craft permit you to know her characters as you would your own family. You get to know them intimately with both their flaws and pettiness as well as their great moments. We are all like Teddy and Nancy, Viola, Gertie,and Sonny.She permits you to join in their lives as if it was your own. Moving and beautifully done. His timing was perfect and his smooth alteration in accents between London, Yorkshire, Scotland, Australia, and America was stunning and contributed in a major way to my enjoyment of this book. That is an aspect I would not have appreciated if I had read it in book form. This book moved me. 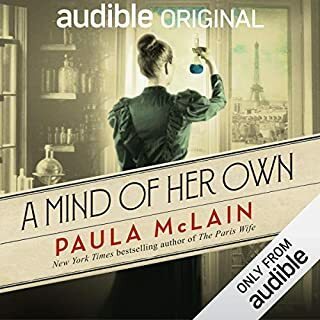 The writing and the narration of the writing are both spectacular making me want to continue my listen at the end of each chapter and sad when it was over. I also felt that the RAF bombing scenes were done with great attention to historical detail giving me a much better understanding of what the air campaign in WWII was about. Great book. Great characters. I have never in my life finished a book and then immediately started reading/listening to it again. But that is exactly what happened last week when I finished listening to "A God in Ruins." I did not want to let go of these characters, and I wanted to go back and find any small thing I might have missed along the journey of this story. And I have to say, the writing and the story were just as compelling the second time around. My enjoyment was also hugely enhanced by Alex Jennings' perfect and invisible narration. This guy can read a book! 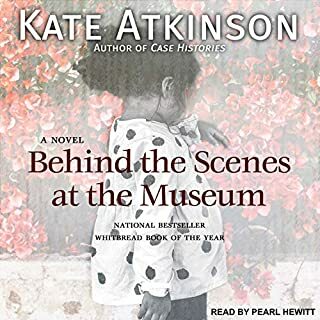 There is so much in this book-- an engaging multi-generational family story, war history and its aftermath, beautiful language and imagery, humor, love, tragedy, and horror-- Kate Jackson has given us a stunner of a novel, and Alex Jennings' performance brings it all to life. Masterful follow-up to "Life After Life"
Atkinson is a literary writer of the highest caliber, a magician with words and story. When I heard there was a follow-up to her supremely artful and wondrous "Life After Life," I RAN to Audible. A GOD IN RUINS is yet another feast for lovers of carefully culled words, and deeply developed characters. My only complaint is that, at 16 hours, it STILL wasn't long enough for me. 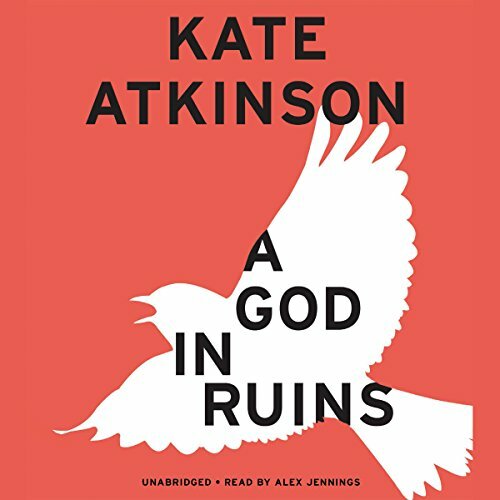 What other book might you compare A God in Ruins to and why? Obviously, it is Atkinson's LIFE AFTER LIFE, where we first fell in love with Teddy Todd, now the protagonist of A GOD IN RUINS. But I also put this book in a the same category as Anthony Doer's ALL THE LIGHT WE CANNOT SEE, as well as any of Pat Barker's brilliant WWI books, and also Louisa Young's MY DEAR, I WANTED TO TELL YOU, and LOVE AND TREASURE. I might even add to that UNBROKEN. You can tell that Kate Atkinson puts great and careful thought into each word she chooses to put on the page. Alex Jennings does honor to the author by beautifully voicing each character--and not getting in the way. I did. I listened in a two-day period. All the while thinking, "Don't listen. Stay away. Let it last. "I'm taking a week off and then starting it over. Unlike a fine wine that is gone once it's been consumed, I can thankfully listen to A GOD IN RUINS over and over. 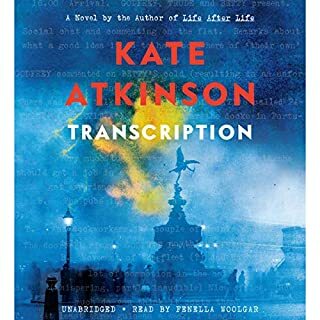 I really loved the fact that at the end of this book, Atkinson actually discusses how she came to do a follow-up to LIFE AFTER LIFE, and then why she put it into the format she did. She explained her desire to write a book specifically about the British bombing raids of WWII. If you have not read LIFE AFTER LIFE, you might still enjoy this book. But if you read this book first, I am almost positive you'll want to then go back and read LIFE AFTER LIFE.I am so grateful to have read this touching, introspective, thought provoking look at the moral dilemmas of those fighting "the good war." I wish I could give it ten stars. One of the previous reviewers says that it's a depressing story if you're over 60. I spent the last hour of the book weeping, which was rather unfortunate because I was driving back to Santa Cruz from L.A. and it was kind of hard to keep my mind on the road. I'm not sure that I'd call it depressing -- it's just a book that causes the reader to reflect on all sorts of things, and if you're over 60, it leads you to some serious contemplation. It's a wonderful book, and I found all of the characters to eventually be sympathetic, but Teddy is a great character and I'll probably listen to the book again just to spend some more time with him. The narrator is excellent. Highly recommended. Atkinson's Life after Life was one of my top five novels a few years back. It's series of "What ifs" in the life of Ursula Todd, born in the 1910s: what if Ursula had been stillborn or lived into old age, married or never married, stayed in England or spent years in pre-war Germany, etc. To me, it seemed as much an exercise in writing--what an author decides to do with his or character and plot--as the kind of spiritual quest others have suggested. A God in Ruins tells the story of Ursula's youngest brother, Teddy, who we know from the earlier book was a heroic RAF fighter pilot during World War II. (If, like me, you read the first book several years ago, you'll begin by questioning your memory about what happened to Teddy there . . . ) Here, Atkinson gives us another "What if"--but only one, and that comprises the bulk of the novel. The novel moves back and forth through time, from Teddy's wartime experiences to the early years of marriage and fatherhood, on into old age and, finally, death in 2012. He's a likable character, a decent man who cares deeply about the men in his crew and his family, continually trying to put things right without offending anyone. Most touching is his relationship with his two grandchildren, neglected by a mother who blames every flaw in her character and misadventure in her life on the fact that her own mother died when she was nine. Some chapters are devoted not to Teddy but to Viola, his only child, and her treks through commune life, drugs, several marriages, novel writing, and failed motherhood, and a few focus on Teddy's grandchildren, Bertie and Sunny. As other reviewers have mentioned, Atkinson also gives us through Teddy a detailed inside look at the experiences of war, particularly those of a bomber crew captain. While I liked this book well enough, it can't compare to its predecessor. I can't really explain why without giving away too much of Atkinson's "surprise" ending, but for me, the "what if" just didn't work and was totally unnecessary. This could as easily--and perhaps better--have been a stand-alone novel about someone NOT a member of the Todd family. And I found some of the spiritual speculation in the last pages a bit heavy-handed and forced (not to mention irritating). Still, putting that aside, the book is well written, the characters well drawn, and the main story fairly engaging. The narrator was quite good. The historical research required to bring alive the experiences of WWII bombers over Germany is beautifully woven into the very touching lives of the book's characters. You'll be drawn in, and perhaps enlightened and surprised. Beautiful writing, but . . . 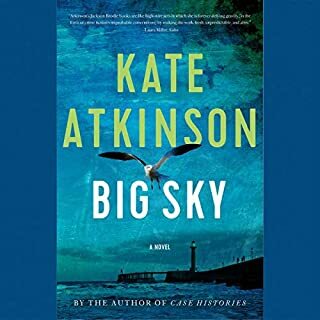 I love Kate Atkinson, have read everything she's published, and will continue to do so. This is beautifully written, and sections of it are extremely engaging and moving. I think I would have done better with this book had I read it instead of listened to it. I wasn't thrilled with Alex Jennings' narration for two reasons: (a) his voicing of women, particularly Teddy's daughter Viola, and (b) his reading of quotations in the voice of the characters who said them. As in, when Teddy is thinking of something his wife or daughter said, it is spoken in his wife or daughter's voice. I understand the intent but found that it kept jarring me out of Teddy's thoughts. It gave the quotes an affected, somewhat sarcastic tone. The book jumps around in time, particularly at the beginning, and that made it difficult for me to feel a strong connection to Teddy. I never really did, which is one of my problems with the book. He's a kind, sweet, moral man, but I didn't find him very interesting. His daughter Viola is such a pill that it's hard to believe anybody could be this unpleasant, and I found the voicing of her difficult to listen to. There's only so much time one wants to spend listening to this kind of person! The sections dealing with Teddy's war and his bombing raids are marvelous, as is the section about Teddy's grandson Sunny's childhood. Some of the book's characters resemble archetypes more than people; their actions and personalities are so extreme and without redeeming factors. Viola, her husband Dominic, and Dominic's mother are difficult to swallow as real people.